The only shadowrunners in the world who don't understand the importance of eliminating the competition are the ones who have already been eliminated by someone else. The Horizon Corporation wants its stable of music artists to sell a few more albums and its brain trust has decided that the best way to accomplish this is to move some artists at the top of the charts out of the way. Outright killing the competition is no good - that often just boosts the deceased's album sales. The secret is to get the public to stop wanting what they're currently buying, and Horizon has developed some creative ways to make that happen. Anarchy: Subsidized is a complete adventure that takes shadowrunners to Neo-Tokyo and plunges them into corporate intrigue involving street gangs, vandals, scandal-mongers, and one of the most impressive technological innovations the entertainment industry has ever seen. 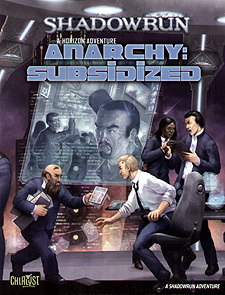 Anarchy: Subsidized is for use with Shadowrun, Twentieth Anniversary Edition.